Content Marketing is one of the most effective uses of your marketing budget. It generates over three times as many leads as outbound marketing and costs 62% less. While this is an impressive statistic, for it to hold true for your business you need to ensure you have a comprehensive content marketing plan. Scoring your content can help see that your content marketing strategy is successful and your budget is being well spent on content your customers will engage with. If your business has a content strategy, then you are likely already measuring the effectiveness of your content (if you're not then you should be!). While analytics such as page views and social shares are helpful in measuring audience size, they do not give a clear picture of the impact of quality on your content effectiveness. Without focusing on quality-based performance metrics, seeing a return on your content marketing efforts is next to impossible. That's where content scoring comes in. "Content Scoring is the process of setting and measuring the predictive performance of content, prior to publishing." Surprisingly, only 28% of B2B marketers say they have a documented editorial mission statement. (Content Marketing Institute, 2015). Scoring your content helps gauge whether your content has met your editorial guidelines or not, maintaining brand consistency across all of your content. As a result, you can see which content is the most effective to ensure that only high-quality content is created for future campaigns. Yes, you need your content to be engaging, but that does not mean you can let everything else fall by the wayside. Consistency and Quality are two key factors to strive for when creating content you want to see a return on. As more and more brands understand the value of content marketing, it is becoming difficult to penetrate the market and attract the attention of an audience. Picking a message and sticking to it is key to the success of any brand. Don't try to do too many things at once or you will end up going off message and confusing your customer. Pick one thing and do it really well. Big brands know how to portray themselves consistently and its part of the reason they are successful. They each have a clear message and use it to establish trust with their customers. As stated by TechiPedia, consistent brands are worth up to 20% more than those that aren’t. The same applies to the content you create - you need to have a unique (but consistent) tone of voice that encompasses your brand. It’s easy to create blogs, ebooks, emails and other content marketing materials in the digital age. Anyone can do it, but that doesn't mean that anyone should. As ideas are generated quickly, a lot of content gets published without thought. Meaning content is often put out that is not consistent with the brand message and ends up doing more harm than good. If you’re not consistent, you're missing out on a great chance to connect with your audience and build a strong relationship with them. You can touch on all of their pain points and develop trust with them. This is crucial in ensuring they return to your brand over and over again. When you create great content, you capture your audience's attention and make them want to come back for more. It's like when you have a favorite actor or actress who has consistently excellent performances, you will go to see any movie they're in just because you like their previous work. When you start using content scoring and assessing your content effectiveness, you will start creating content that is more relevant to them and it will have a more significant impact. You can adjust your content strategy to include topics that are performing well and take out what is not working to ensure you only produce compelling and useful content that resonates with your audience. Creating high-quality content is vital to any business. With the stiff competition out there creating similar content and audiences having even shorter attention spans, you need to be able to create content you know will capture your audience's attention. The process of understanding your audience and creating content for them takes time, you have to assess what is working and what is not continuous; and then use those insights to adapt your content strategy. This is where scoring content comes in. It lets you develop a stronger understanding of what your audience needs, how your content influences them and how specific types of language effect them. What engagement metrics have the greatest impact on your business? Those with fewer points will be less important than those more. Measure how your content is performing, is it meeting or exceeding the goals you set? What is making specific content perform well and others not? This is often a problematic task but should be looked at objectively so you can see patterns within your high-quality content and replicate what performs well in future. Rinse and repeat. Content Marketing is an ever-changing world, you should measure and analyzes results from previous campaigns and apply your new knowledge to future scoring. Content marketing has taken off exponentially over the past few years with almost every B2B company having some form of content strategy. Consumers are annoyed by invasive and in-your-face ads that appear cheap, and pushy. Instead, they want business to be authentic, helpful and friendly. 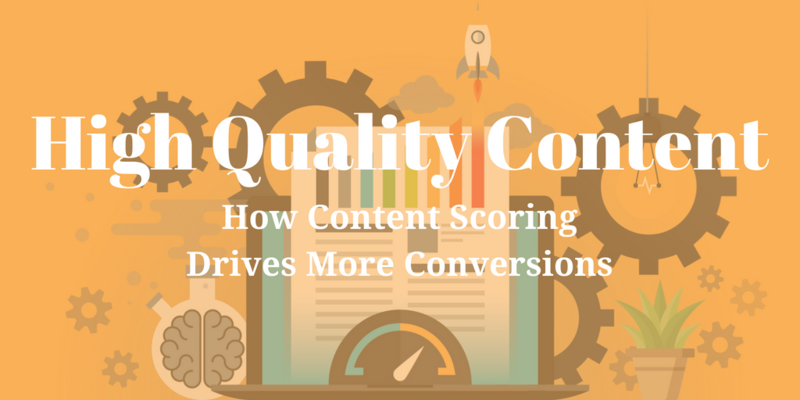 Content Scoring is the key that unlocks content with high conversion rates. The better you know your audience, the better you can influence their experience with your content and persuade them to buy into your brand. The only way to judge and predict how your audience is going to behave is by consistently assessing how your content is performing and making changes to it according to your results. This is why content scoring is much more effective than other vanity metrics in helping you get the best ROI on your content.